With the speed in the data center now increases from 10G to 40G, different optical technology and cabling are required. But at first we should figure out the design of 40G Ethernet network. There are several key factors that may affect the transition to 40G. This article today will pay special attention to those aspects that influence data center design consideration. The principal goals in data center design are flexibility and scalability, which involve site location, building selection, floor layout, electrical system design, mechanical design and modularity. Furthermore the key to a successful data center facility: one that is sustainable in the long term; the other is to consider it as a receptacle for equipment and operations, as well as an integrated system, in which each component must be considered to be flexible and scalable. 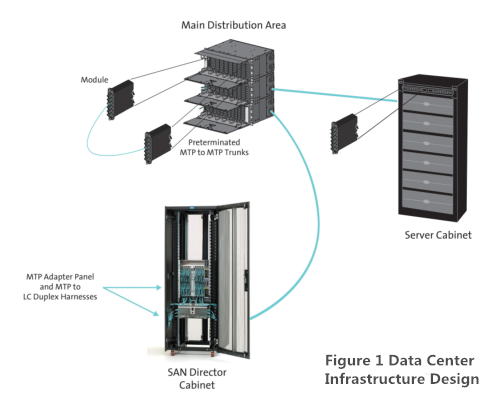 Figure 1 shows a typical data center infrastructure design utilizing preterminated optical solutions. What Does MPO Connector Means for 40G Data Center? While speeds have increased to 40G, optical connectivity has remained in a duplex format, whether SC or LC. With the advent of 40G/100G Ethernet, multi-fiber push-on (MPO) connector technology are now used at the electronics interface and further into the data center infrastructure design. MPO technology has displayed proven value in cassette-based data center physical layer installations. The MPO is defined by TIA-604-5-C, Fiber Optic Connector Intermateability Standard. 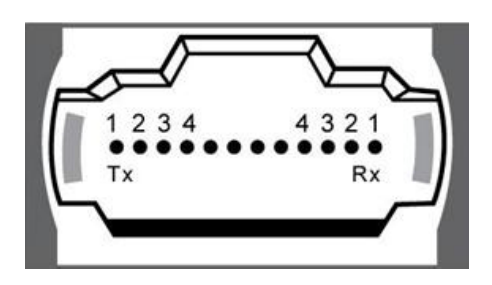 Type MPO (FOCIS-5) as an array connector that can support up to 72 optical fiber connections in a single connection and ferrule. While the MPO is versatile in the fiber count supported, the 12-fiber MPO is the version widely deployed. Many data center designs today use cassette-based duplex LC connectivity or MPO to duplex LC harnesses at the electronics interface, while 12-fiber MPO-based connectivity is used to connect the trunk cabling to each cassette or harness. As noted above, the QSFP+ module is specified for use with different standard. The 40GBASE-SR4 is terminated with the MPO connector. For example, Cisco QSFP-40G-SR4 QSFP+ transceiver enables high-bandwidth 40G optical links over 12-fiber parallel fiber terminated with MPO/MTP multifiber female connectors. For 12-fiber MPO cassette-based optical systems already installed, 40G migration is as simple as removing the existing cassette from the patch panel housings at the equipment and cross connects and replacing the cassette with an MPO adapter panel. Next, an appropriate 12-fiber MPO jumper would be used to cross-connect the trunk cabling as well as interconnect into the QSFP. Though not widely available currently, future preterminated system trunks may utilize 24-fiber MPO connections, both on the trunks and on the cassette. In this case, 40G deployment would require an interconnect harness terminated with two 12-fiber MPO connectors at the QSFP end, and one 24-fiber MPO at the trunk end. This would provide the needed interface with the 24-fiber MPO-based trunk and the 40G QSFP. A 24-fiber MPO jumper would be needed at the system cross connects to ensure polarity was maintained and that skew was within requirements. The data center infrastructure must be reliable, manageable, flexible and scalable no matter who you are asking for requirements of data center design. It is the responsibility of the network designers to insure best compatibility of data center. As migrating to 40G, we have 40G QSFP and cables within MPO connectivity. Fiberstore supplies a variety of 40G QSFP modules and cables for you to choose from. Besides QSFP-40G-SR4, QSFP-40G-SR4-S and Cisco QSFP-40G-CSR4 are also available. If you are interested in our products, please contact us directly. This entry was posted in Fiber Optic Assemblies and tagged 40G Ethernet, 40GBASE-CR4, 40GBASE-FR, 40GBASE-LR4, 40GBASE-SR4, Cisco QSFP-40G-CSR4, data center, MPO connector, QSFP-40G-SR4, QSFP-40G-SR4-S, QSFP+ module on January 28, 2016 by Angelina.Li.